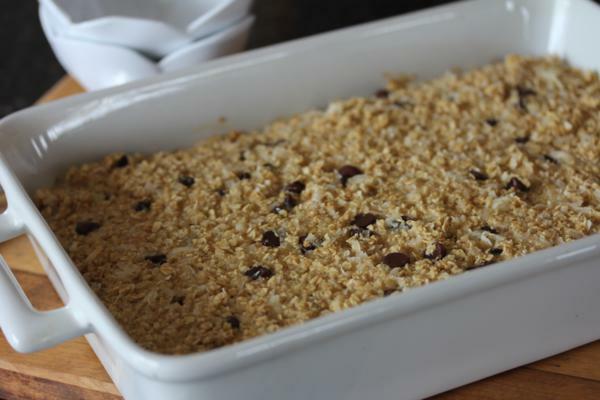 Who wouldn’t love the flavors of a mounds bar in a baked oatmeal? Really how could that be bad?! Okay, if you hate coconut, like one of my children does, this baked oatmeal is probably not for you. But if you love coconut and mounds bars, I think you will love this. This is my new favorite baked oatmeal. I know I say that almost every time I share a new baked oatmeal, but really they are all my favorites. And I hope you all are not getting tired of my baked oatmeal recipes. I know I have quite a few of them, but I love coming up with new ones to share. This newest one is a bit on the sweet side, but it is so good. It might not be an everyday breakfast, but this is a great special occasion breakfast. It would be perfect for this weekend! I made this for the first time a few months ago and I have lost count of how many times I have made it since then. We love it! Well, the coconut loving family members love it. I usually make my triple berry baked oatmeal for the non coconut loving family members. You could easily turn this into an almond joy baked oatmeal by adding in some chopped or sliced almonds. That would be delicious! 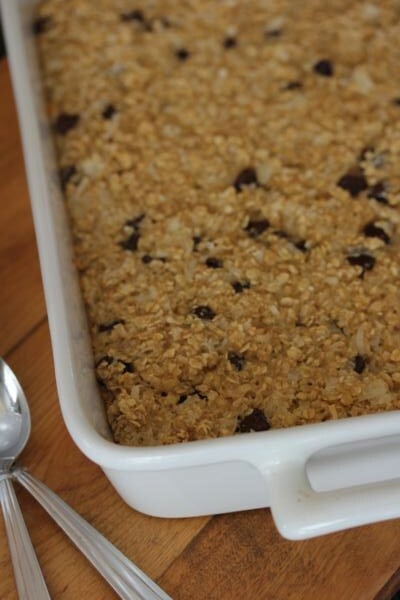 And this baked oatmeal is just like all my other baked oatmeal recipes and they freeze great. 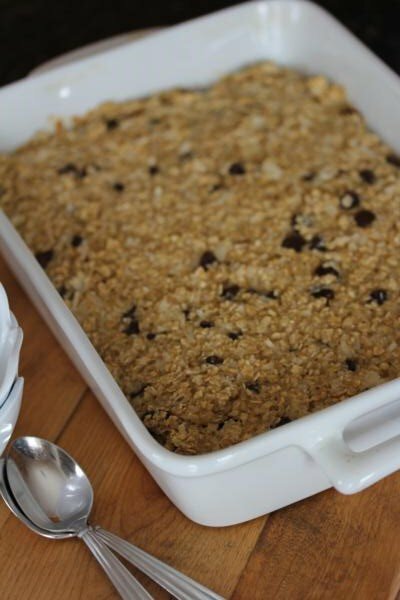 Be sure to check out the post I did on freezing baked oatmeal. 2. In a large bowl mix together all ingredients expect chocolate chips. Stir to combine well. 4. Spread into a 9×13 pan. 5. Bake for 20-25 minutes or until set. If you want it a little crunchy on top bake a little longer. 6. Serve warm. Pour milk over top when serving if desired. Sounds so good! I’ve always wanted to try some of your baked oatmeal recipes. Maybe I will this weekend for Easter breakfast. One question, the recipes always call for quick oats. I only buy old fashioned. Do you think the recipe will come out okay with old fashioned oats? Yes you can use old fashioned oats. The texture is slightly different and some people increase the liquid just a little bit, but yes they will work just fine. I hope you enjoy it! Wow – this looks really good! 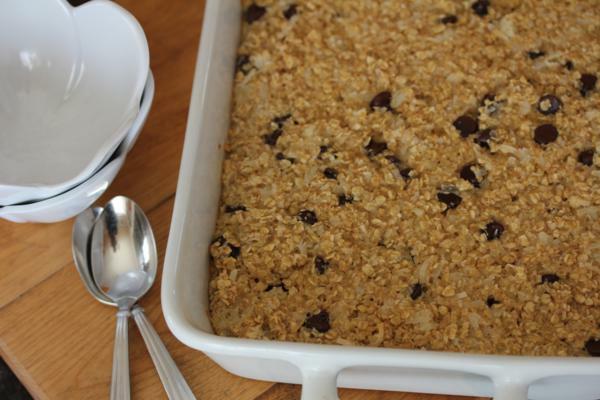 We love your baked oatmeal recipes and are always excited when you come up with a new one. Yippee! 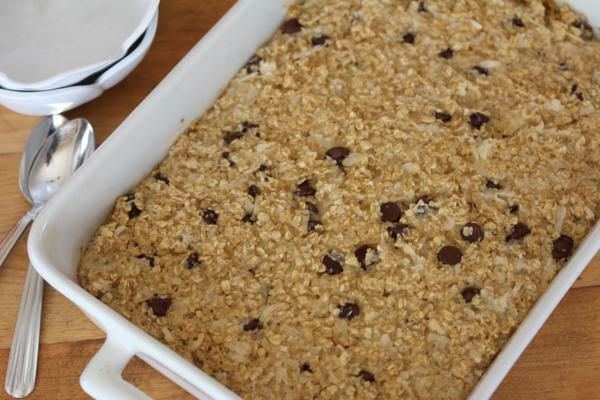 Another baked oatmeal to try! We love your baked oatmeal recipes. Have you ever tried making a pineapple upside down version? I just spotted a leftover can of pineapples while making oatmeal for tomorrow and thought that would be delicious. I have not tried that version, but thanks for suggesting it. I may have to work on that one. This looks delicious! I read how you freeze the oatmeal in muffin size, but I’m wondering how you reheat it. Please keep the baked oatmeal recipes coming! We love them and use your recipes all the time. I have to be at work at 5:30 am and baked oatmeal is one of those easy, yummy recipes my husband can feed our kids. He says it makes his mornings so much easier! I am so glad that you enjoy my baked oatmeal recipes. I love hearing how they help make breakfast easy and delicious. I have a new version that I hope to share in the next few weeks. I love coming up with new versions to share. Have a great day!